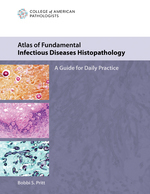 Atlas of Fundamental Infectious Diseases Histopathology contains real-world, practical information on commonly encountered infectious diseases for all levels of pathologists, from trainees to attendings. Examples are drawn from cytopathology and surgical pathology to autopsy pathology and dermatopathology. Mimics of infectious diseases are also included with each chapter. Contents include: bacterial infections; fungal infections; viral infections; parasitic infections; patterns of inflammation; commonly used stains; stain preparation and interpretation; ancillary methods, including molecular diagnosis; and morphologically similar organisms.